Wayne's Take: Your government held hostage by republicans! Your government held hostage by republicans! It is crazy. Our government is being held hostage by Americans voted for to run our government. There is blame going both ways and there is normally 2 sides to every story and this one does too. The difference here is that one side is very definitely lying about the situation which involves the Debt Ceiling and the Affordable Care Act (ACA). So if you live in a cave here is what is being said by both sides. "We want to fund the government and we want to give the American people what they want with regards to the ACA." "We want to fund the government and will not let a few republicans hold the entire nation hostage in a attempt to kill the ACA." Well there are 2 parts to this. 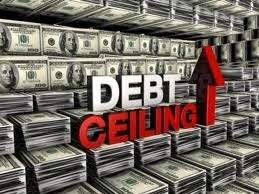 One is funding the government by raising the debt ceiling. This involves allowing the government to get the funding they need to pay bills they have ALREADY incurred. This has happened, automatically many times. The only times it hasn't is when the republicans try to hold the country hostage over some legislation that they don't like but still passed. This isn't new spending. This isn't money for new stuff. It is paying the bills you already have. It would be like going and getting a mobile phone that isn't pre paid. Signing a contract saying you'll pay $25 a month for a certain plan. Using your phone for that entire month using all the benefits of the plan you signed up for. At the end of the month when you get your bill you then refuse to pay and tell the phone company that you won't pay unless they provide you electricity in the Antarctic. 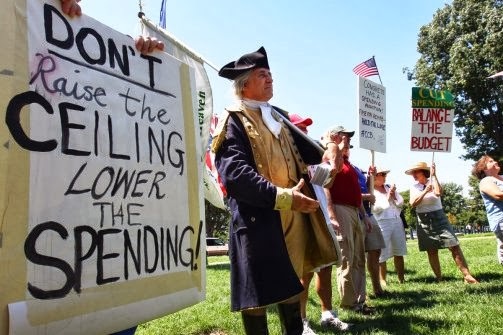 Sadly this is what to many American's think ...that not raising the debt ceiling now is the way you stop spending later. This is like thinking by not paying your bills now that you won't buy that new toy tomorrow. How about pay the bills we've incurred, stop fighting wars we can't afford, stop buying tanks our military doesn't want, start asking the extremely wealth to actually pay their fair share! The second demand has nothing to do with your phone plan. The second part being the affordable health care act which the republicans claim most people don't want. What is the reality tho? The fact is that Obama was re-elected on a platform that was clear that the ACA was going to be implemented. Citizens voted and he was placed back in office. The law was legislated and even challenged as unconstitutional but the highest court of the land ruled that it is constitutional. It has been challenged over 40 times in congress, costing the American tax payer about $2.5 million each time it has been, and won every single time. The president is willing to talk about sensible changes to the ACA but will not have the government held hostage over it. The talking heads in the republican party would have you think they are willing to "compromise" but this is like a hostage taker saying they'll compromise on how many millions of dollars they'll get while they hold a gun to your child's head. All of the "compromises" equate to the same thing. Death of the ACA. The republicans are lying when they say they say they will compromise and the democrats are unwilling. Too many American's don't understand even the basic premise of the ACA. Many American's don't even know that "Obamacare" and the ACA are one and the same. No wonder with the smear campaign using misinformation against the ACA. One can argue that the ACA is complicated and you would be right. But the issue is complicated. How can you unfuck a broken health care system that leaves out so many Americans with a "simple" system. It is like complaining that you can't cure a genetic disorder by taking an aspirin. The executive branch hasn't explained the program very well either. Some of the confusion arises from introduced bits as "compromises" that republicans asked for. Here is the ideal ACA premiss. Health care should be attainable by all American. Most American should be able to pay for private health insurance. Insurance companies should not be able to deny health insurance to those that need it most. Insurance companies should not be able to stop providing insurance to those that need to use the insurance they supposedly have. The government should subsidise health care for those that are of lower income status. Women shouldn't have to pay more for health care then men. Health care should not have their costs artificially and arbitrarily inflated. For those that want specifics and more detail then go here. Just don't complain that it is to complicated. If you want to know the mysteries of the universe then you can't complain that you have to understand things like quantum physics, general and special relativity. This is achievable because insurance companies that previously denied benefits to individuals either for pre-existing conditions or cut off benefits to individuals that end up needed said benefits now can offset that risk by knowing that everyone will be covered. Many people complain that they shouldn't have to be covered medically. But we require people who drive to have insurance. Some might say that people can choose not to drive and thus not pay car insurance so some people should be able to choose not to receive health care and not pay insurance. The difference is somebody that doesn't drive doesn't all of a sudden find themselves behind the wheel of a car. People who are healthy DO find themselves faced with an unexpected illness or injury. People don't often just agree to lay down and die but will seek medical attention. The biggest cause of bankruptcy is from medical bills. This means that the bills remain unpaid. People without insurance also end up using forms of care that are inherently more expensive like emergency rooms. Going to a general practitioner to get looked at is much less expensive then going to the emergency room and taking up a spot that is geared up for situations that are more life threatening. Another part is getting the cost of health care down. Right now in the USA health care is the free market gone crazy. Do you know you can pay 20x or more for medication in the USA then you would in other countries. Same medication! Why is this? Well in places like Australia, England and Canada the government says "Hey we'll put medication x on our pharmaceutical benefits scheme but you have to make the cost reasonable!" The government then will subsidise the cost of the medication a bit. People still have the choice to use medication that is not on the pharmaceutical benefits scheme if they choose. So what happens is the pharmaceutical companies still make money and the people don't get ripped off unless they choose to be. This doesn't just happen with drugs. It happens all over the place. Sure this does mean that you might end up paying more if you choose to use something that isn't on some government benefit scheme but that is your choice. For example the government goes to companies and says "We want product x with these specifications" and those companies come back with their solutions and a the cheapest ones that meet the specifications are chosen to go on a benefits scheme. Those companies know that they'll sell more so their margins can be lower. This doesn't stop other companies from making more expensive products and does not stop you, the consumer, from using those companies. What it does do allow most American's to access that product at a reasonable price. In health care this is especially important because if you are told "You need medication x to stay alive." you shouldn't be held to ransom to pay 20x the reasonable cost of that medication. Really what are you going to say? "No I refuse to pay!" which in reality many people are forced to do when they can't afford to access the health care they need. Others access that health care but end up going bankrupt and the rich just pay the costs and move on. Health care shouldn't be a luxury. If governments can say that "Internet access" is a basic human right I'm sure that basic health care should be one too! Watch this video. There is a lot of humour in it but it is very informative too. You'll find yourself laughing then a bit disgusted when you realise that while some of it sounds ridiculous it is actually all true. What the republicans need to do is let the government be funded no strings attached because it is a bill the government has already incurred. Then if they want to make changes to the ACA then that is another matter that can be handled separately. Note almost every other time they've done this they've just tried to kill the entire thing not make it better. Also note that the basic plan is THEIR PLAN! The individual mandate is a republican idea. Many people might not like it but, at present, it is the most logical plan on the table. The government is all about doing what is best for the citizens as a whole even if they don't understand it. Ask all Americans if they would like medical care if they are injured. See how many people say "no". That should be the same number of people that support reform in the health care sector.